TOP SHELF POLO: Rain? What rain? It's rained almost every Thursday for the past month. Same story tonight, 'cept a dozen people showed up regardless! 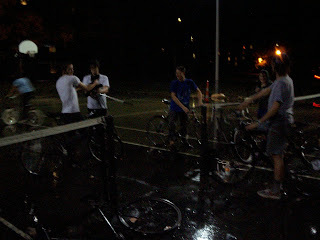 Even after it started pouring everyone just kept playing. A good night indeed. Edwin got a new Eighth Inch Scrambler frame that he's building into a dedicated polo bike. And Evan build up an old steel frame into a very nice fixed setup. Lembo is fine tuning his Ross and even I have a few new parts coming my way. Though I still think Crashley's folding bike with white bmx tires is the best polo bike ever! And my hand hurts from that damn fence. Oh yeah, and that alleycat is happening on Saturday at 3pm. Meet at people's park.